In this tutorial, I will explain how to create a shiny summer text effect using layer styles in Adobe Photoshop. Let’s get started! “It’s always best to start at the beginning—and all you do is follow the Yellow Brick Road.” This tutorial will show you how to use a brick texture, a simple brush, and a couple of layer styles to create a Yellow Brick Road inspired text effect. Let’s get started! Follow this new tutorial and learn how to create a summery dragon fruit text effect in Adobe Illustrator. In this tutorial I will show you how to use a couple of layer styles, with a nice space texture and a flare brush tip, to create a Star Wars inspired text effect. Let’s get started! In the following steps you will learn how to create a set of detailed balloon pattern brushes and how to use them to create a neat text effect in Adobe Illustrator. In this tutorial, I will walk you through the process of making a yummy donut text in Illustrator. We will use the basic tools and effects along with some basic vector shape to achieve the final outcome in short time. In this detailed tutorial, we’ll be learning how to create a shoe lace text effect using Adobe Illustrator. For beginners, you will learn how to create a shoe using the Pen Tool along with some vector shape building techniques and several effects (Gaussian Blur, Drop Shadow). Next, you will learn how to create the lace text using again the Pen Tool and some other basic tools. In this part, combination of linear and radial gradients can be very useful for achieving nice results in creating realistic vector illustrations. Let’s begin! In the following steps you will learn how to create a detailed copper pipe text effect in Adobe Illustrator. If you’ve ever attempted to write words using traditional light painting photography techniques, you probably know how challenging it can be to create words that are easy to read. In this tutorial, we will demonstrate how you can create a similar look without a camera and tripod. Let’s get started! 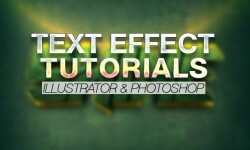 In this Illustrator tutorial learn how to draw a tubes of paint text effect. The tutorial is composed of two main parts, creating the oil-paint text and creating the tubes. You will start from basic shapes, fill them with some complex linear gradient and then apply the Gaussian blur effect for the results. Looking for a nice little gift? This tutorial will show you how to use a bunch of layer style, textures, and shapes, to create a bright, colorful pendant text effect. Let’s get started! In the following Illustrator tutorial you will learn how to create a carrot text effect. The latest Photoshop update comes with a couple of pretty awesome new layer style features, such as multiple layer style instances and stroke overprint. This tutorial will show you how to use those features to create a one-layer-only, retro text effect. Let’s get started! Photoshop’s 3D environment has multiple tools and settings to create great 3D effects. This tutorial will show you how to use those tools and play around with the settings to create a shiny, elegant, white and gold, 3D text effect. Let’s get started! In this Photoshop tutorial, I will show you the process of creating this Rusted Metal Text Effect Inspired by “Mad Max” Movie. Have a go!